UPDATED: Sat., Feb. 9, 2019, 11:03 p.m.
PULLMAN – Gage Gubrud made the first start of his career against the Washington State Cougars. Now he’s one of them. After a long and at times strenuous process for the FCS All-American and two-time Walter Payton Award finalist, Gubrud got the clarity he was looking for Saturday. 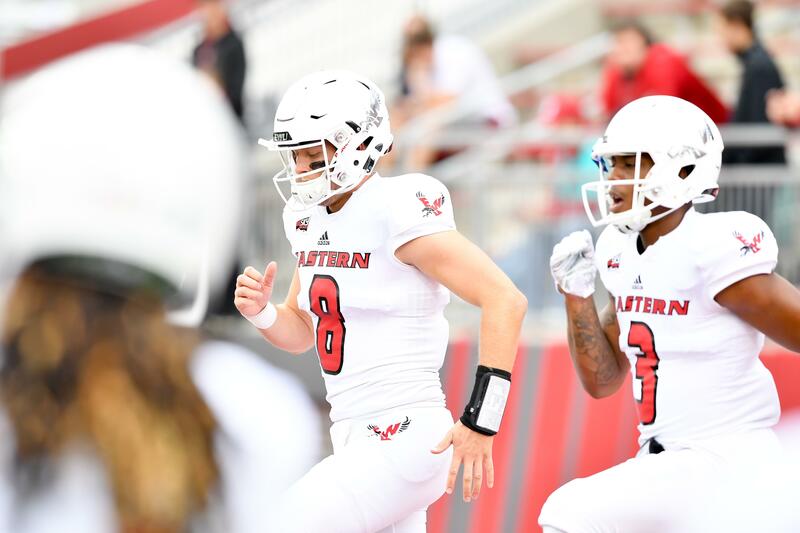 The former Eastern Washington quarterback will spend his final season of college eligibility in the Pac-12 Conference, at WSU, after earning a medical redshirt from the NCAA. According to Leach, Gubrud will enroll in graduate courses on Feb. 18, which allows him to participate in spring football and get a head start on learning the Cougars’ high-volume passing offense. Gardner Minshew picked up Leach’s Air Raid schemes in a hurry after transferring from East Carolina, though he didn’t begin practicing with the Cougars until August. Gubrud has time on his side but doesn’t have Minshew’s background knowledge of the Air Raid, which helped the eventual WSU starter fend off challengers Trey Tinsley and Anthony Gordon. Unless former four-star recruit Cammon Cooper or early enrollee Gunner Cruz make an unexpected push, Gubrud will be in the same position Minshew was last year, auditioning for WSU’s starting job alongside two QBs – Tinsley and Gordon – who have significantly less game experience but a decent understanding of the Air Raid and the respect of the locker room. Gubrud was a three-year starter at EWU who collected just about every accolade available to an FCS quarterback. But his journey wasn’t as easy as it looked on paper. Gubrud, a native of McMinnville, Oregon, didn’t earn a scholarship out of high school and may become the third straight former walk-on to start for the Cougars, following in the footsteps of Minshew and Luke Falk. The NCAA moved swiftly to overturn the initial decision, granting Gubrud his sixth year of eligibility less than a week later, although it’s unknown what criteria was used to reverse it. Nonetheless, the QB’s situation may be unprecedented at any level of college football. Gubrud suffered a season-ending toe injury during EWU’s fifth game of the year, at Montana State. Explosive sophomore backup Eric Barriere took over and guided the Eagles to the FCS playoffs, then carried them to the national championship game, which EWU lost to North Dakota State 38-24. The NCAA states that a player is eligible for a medical redshirt if he played in one-third or fewer of his team’s games. Gubrud fell under that umbrella, but only because the Eagles advanced to the national title, and therefore played in 15 games. The S-R learned on Jan. 10 that Gubrud had entered his name into the NCAA’s transfer portal, and the QB later confirmed that he’d narrowed his choices down to WSU and Utah. The school down the road piqued Gubrud’s interest – which was telling by his social media activity and the numerous WSU football-related Twitter accounts he began following. Over the years, Gubrud had also become close with a few WSU players – namely linebacker Peyton Pelluer. Gubrud will be back in Martin Stadium three years after making the first start of his career there. He and wide receiver Cooper Kupp, now with the Los Angeles Rams, charged the Eagles’ offense in a 45-42 upset win that saw Gubrud contribute six touchdowns – five passing and another rushing. He completed 34 of 40 attempts for 474 yards in the game and rushed for 77 yards. Minshew’s elusiveness gave WSU’s offense a new dimension in 2018, but Pac-12 defenses may have an even tougher time tracking down Gubrud. “When he’s on the move, he’s fairly threatening,” Leach said. “Some guys, when you get them on the move and you say, ‘Good he’s on the move, he’s liable to screw this up.’ … Then other guys kind of put you in that screwy bind of, OK you’ve got to affect the quarterback, because if you don’t affect him there won’t be any bad throws and you won’t sack him. By the end of his sophomore season, Gubrud had become one of the most electric quarterbacks in the nation, turning heads with his legs when he wasn’t doing it with his arm. He was twice named a finalist for the Walter Payton Award (2016, 2017) – the FCS equivalent to the Heisman Trophy – and earned FCS All-American honors in 2016. That same year, he shared Big Sky Player of the Year honors with Kupp. Without Kupp, Gubrud and the Eagles were flattened 59-24 this season by a much stronger WSU team, although the QB found humor in watching snippets of that game when coaches pulled up the season highlight reel all recruits watch when making their official visit. If Gubrud can recapture the level of play that made him one of the most captivating players in the FCS, the Cougars – fresh off the first 11-win season in school history – should again stake their place as a contender in the highly competitive Pac-12 North. On offense, WSU returns four of its five starting offensive linemen, seven of the eight rotational receivers and a special talent at running back in sophomore Max Borghi. Over an EWU career that spanned 32 games, Gubrud completed 753 of 1,165 passes (64 percent) for 9,984 yards, 87 touchdowns and 32 interceptions. The 6-foot-2, 205-pound QB also has 259 career rushing attempts, 1,042 yards and 13 TDs. Published: Feb. 9, 2019, 10:50 a.m. Updated: Feb. 9, 2019, 11:03 p.m.